I have often fallen into the trap of getting a few things right and then assuming I actually know what I am talking about, a case in point is a compression test I carried out on the Fulvia. I bought the Fulvia while we were on the Tassie Tour in October, it never seemed to have much getup and go but as the previous owner had not driven it much I thought that it just needed an “Italian Tune” (aka a good thrashing). After returning from a trip to Falls Creek which I believe qualifies as the said thrashing I set about doing a compression test to prove the positive affects caning your engine, alas the numbers were not good, coming in between 40 and 80 psi which are the sort of numbers you may expect from a lawn mower. This provided me with the excuse of buying more gauges of dubious accuracy from Ebay in the hope of a better result, but as I had to wait delivery I decided to do the cam timing which involved reading the manual many times then doing what I thought it meant, getting it wrong, going to bed and having a revelation at about 2am then getting it right the next morning. 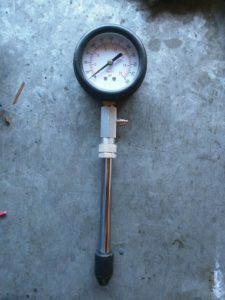 The new gauge arrives, and I get a similar result but now all about 100psi. so an improvement of sorts. It was suggested that the engine needed to be hot with the throttle wide open (HOT & WOT), so I duly did the test again with the same result, very perplexing. Then it was time for Revelation #2: The Fulvia engine is only 1300cc so each cylinder is about 325cc, the hose on the compression gauge is long and is a bit elastic so could I be losing something in the hose or is it just too small in diameter? Or probably a combination of both. Which meant I had to also make a remote starter switch as I now had to hold the gauge in place and turn the starter, the result? Cylinders now read between 150 and 165 psi. which is reasonable for a 47 year old engine. 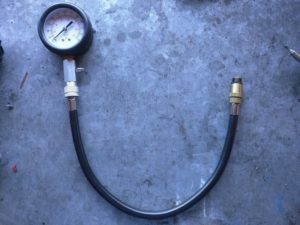 In conclusion, paying less than $20 for a compression gauge may be asking for trouble. However the correct cam timing has transformed the car and it now likes to rev, very Fulvia, very satisfying. This entry was posted in S2 Fulvia Coupe. Bookmark the permalink. Oh…so the valve timing WAS out then! Errr..Yep, does that make you right then? How did you go with the wheel bearings? Thanks Alan, I used the tools to remove and replace all 4 discs and 1 wheel bearing. I am going to take photos and mark them with which tool does what also add to the pile a 3/4″ drive socket I modified to give some purchase to the tool, it needed a huge amount of force to loosen. I will give them to Simmo at the committee meeting next week.